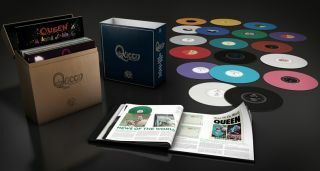 Queen to launch Studio Collection vinyl box set and Queen by Rega turntable | What Hi-Fi? The box set features 18 coloured vinyl discs, cut from meticulously remastered files, and will launch alongside a 'Queen by Rega' turntable. Said to have been five years in the making, the Queen: Studio Collection 180g vinyl box set was put together with the intention of delivering the "optimum sound quality", with every step of the process given the necessary care and attention and Queen's production team closely involved throughout. Legendary engineer Bob Ludwig was chosen to re-master the entire project, adding to his 3000+ list of credits, before the records were cut at half speed (for extra accuracy) by Miles Showell at Abbey Road Studios. Original tapes were uncovered and the best sources for each album and track were decided upon, before Ludwig made fresh 24bit/96kHz digital masters, free from any errors, clicks or unwanted noise. Showell then cut lacquers and then masters at Abbey Road, using the half-speed cutting technique to ensure as accurate an end product as possible. The vinyl records were then pressed at the Optimal pressing plant in Germany, known for its heavyweight 180 gram audiophile vinyl releases. New materials claim to guarantee that the coloured vinyl records do not compromise the audio quality - coloured vinyl traditionally being seen as sonically inferior to black records. The box set features 18 discs that cover 15 studio albums. The Innuendo and Made in Heaven albums were only ever released as edited versions on vinyl but are presented here in full, split across four sides of vinyl. Queen II comes on two records, one white and one black (referencing the Side White and Side Black of the original release). The colour of each vinyl record has been chosen according to the primary colour of the album artwork, though you will also be able to buy each LP individually on black vinyl. To celebrate the release there will also be a Queen turntable. Working in conjunction with Rega, the 'Queen by Rega' deck features reproductions of classic Queen logos, including the Queen crest, designed by Freddie Mercury, printed across the platter. The turntable features the hand-built RB101 tone arm, from the Rega RP1, a new high performance motor promising minimal noise and vibration, and a Rega Carbon MM cartridge. An optional upgrade to the Rega Bias 2 cartridge is also available. A 108-page hardback book will accompany the box set, while every purchase will also come with free 320kbps MP3 downloads. There's no mention of hi-res downloads. Exclusive editorial content about each album is set to be published on the Universal Music site in the run-up to the release. The Queen: Studio Collection box set will cost £285, while the Queen by Rega turntable costs £315. Both are set for release on 25th September.